Our GK400-Y has a reputation all its own for a lot of Go Kart lovers! 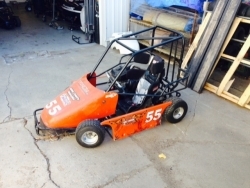 Its 5 speed air cool 4 stroke engine gives this �Buggy�- style Go Kart a awesome performance at mid-size Go Kart level. 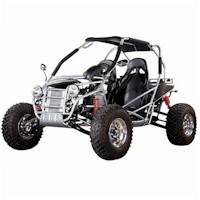 Key Features: * Electric Start with Pull Recoil Start Back Up. * 5 Speed with Reverse. * Shaft Drive. * 4 Wheel Hydraulic Disk Brake. * Digital Speedometer.